Bryan and Missy have definitely experienced the highs and lows of trying to start a family. After 4 years of marriage, they decided to have their first child. That was back in 2011. 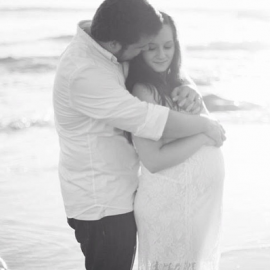 They got pregnant but suffered through 2 miscarriages at 10 and 20 weeks. Their story is one of hope that anyone trying to conceive should read … or watch: they have their own vlog where they record their daily adventures in starting a family. 1. So tell us about the Lannings. We are high-school sweethearts, who have been through a lot in both our lives and relationship. We’ve just recently began opening up to the world through YouTube and sharing our experiences to help others. 2. You are at 37 weeks, so by now you’ve learned a few things about pregnancy. What is the #1 tip you could give to parents who are expecting their first child? Cherish every single moment. Make every single moment a big deal. Make it a grand spectacle. It’ll give you something cool to look back on and will reinforce those memories. 3. Did you do anything special or creative to announce your pregnancy or the gender of your baby? We actually announced the gender with a super cool video! 4. You’ve been through a few baby showers by now, so what is your best baby shower tip? What is your favorite event or game that anyone could add into their shower? 5. What is the #1 pregnancy-related product you couldn’t live without? Coconut oil! I rub it over everything at night. It’s amazing! (NO STRETCH MARKS!) and you can even cook with it! 6. Most of these questions seem to be geared more towards Missy, so we have to get Dad involved. Bryan, becoming a father is an exciting (and stressful) time. What is the #1 tip you would give to guys out there who are going to become a father for the first time? Don’t worry so much about being a great dad. That will come with time. Worry about being a better husband, because you don’t see many good husbands become crappy dads. 8. Favorite book, tv show, and/or movie to enjoy while you’re expecting? FRIENDS. It’s a classic. We watch it all the time. 9. Keeping up with a daily blog or vlog isn’t easy. How do you manage to keep up with the daily posts – particularly on days you just don’t feel up to it? Honestly, daily vlogging is such a huge part of our lives, we don’t even notice it anymore. It’s instinct to pull the camera out and start filming. Bryan can now edit and upload the blog within an hour every night too. There are days we don’t feel like doing it sure, but once we pull out the camera, we start having fun and those feelings instantly go away. 10. This is a difficult question, but one that could be the most helpful to others who share your experience: You guys had 2 miscarriages before this pregnancy. What advice do you have for anyone who goes though such a difficult experience? Have hope. Like I said before I’m writing to you from our hospital room where we just had our baby boy after 2 losses. Hope is so strong. I remember 7 weeks pregnant, my wife was bawling her eyes out cause she was so scared of what could happen, and now look where we are. If you’re grounded in hope, anything is possible. Understand that what you think could be impossible, is seriously within reach. We were a couple where every bad thing just kept coming, and we finally we were rewarded. Here is a link to the birth vlog. So, this story does have a happy ending. Turns out that Bryan and Missy were writing the answers to their questions from the hospital. I guess its true what they say – third time’s the charm! Congratulations to the Lannings and Baby Ollie! And thank you for sharing your story on the Belly Blog.